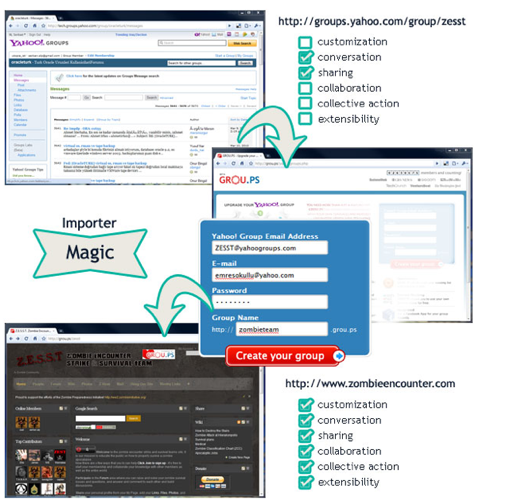 GROU.PS, a do-it-yourself social network focused on moderated online collaboration has unveiled a synchronization tool that allows the group administrators on Yahoo Groups to sync with GROU.PS. So Yahoo Groups admins can incorporate functionality such as, location-based services and chat, into their platforms from GROU.PS. The new tool doesn’t require the Yahoo Group owners to shut down their existing group. They can still continue using their email list. Instead, a GROU.PS group surrounds their old Yahoo Group list and will add additional functionality such as collaboration, deep customization tools and integration with Facebook. GROU.PS will essentially create a whole new social network tailored particularly to that specific list, and augments its functionality with typical social networking features that can be found on any GROU.PS group. The startup’s networks are attractive to users because it lets you run all of your group’s collaboration tools from one GROU.PS domain using a single login. The system supports wikis, photos, links, blogs, calendars, chat, forums, maps, profiles, and subgroups – each of which is available as a plug-and-play module for your community. These modules also allow users to pull in their data from other third party services (flickr, Facebook, Digg, blogs, etc). The startup, which has over 40,000 networks on its platform and 2.5 million users, also added ActivityRank Pipelines, a point and reward system that lets moderators of a social network measure and rank members’ content contributions and then extend moderation privileges to members based on these rankings. And the social network is launching a subscription model that will allow moderators to charge subscription fees to members (GROU.PS gets a 50% cut on any fees charges). GROU.PS raised $1 million in funding, bringing the startup’s total funding up to over $2 million. But while the social network is growing, it is still faces major competition form the leader in the space, Ning, which hit 37 million users with 1.6 million social networks in November.